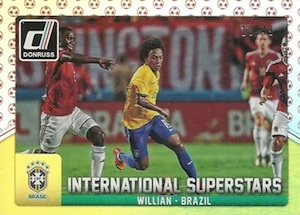 2015 Donruss Soccer cards bring the venerable brand to the international pitch for the first time. Mixing national teams from around the world with several key professional clubs, the checklist features an eclectic mix of players and themes. 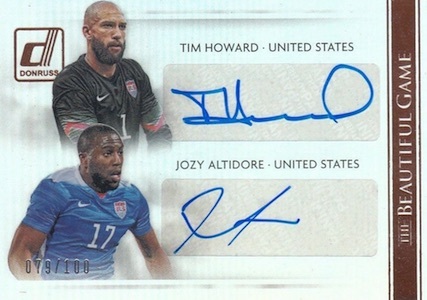 2015 Donruss Soccer hobby boxes come with one autograph and more than 30 inserts. The base set has more than 100 players. 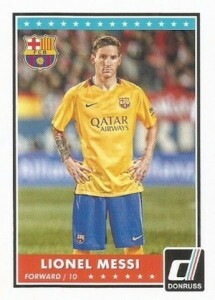 Twenty-five players have Photo Variations where they're pictured in the national team uniforms. Among the seven parallels are Bronze (#/299), Silver (#/199) and Gold (#/99) Press Proofs. Base cards and inserts also have four numbered parallels that use the Panini logo around the card border. These are numbered to 49, 25, 10 and 1. Autographs come in the form of The Beautiful Game Signatures. 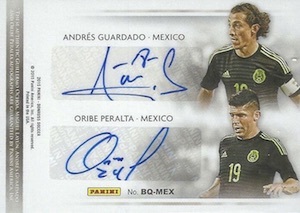 Angel Di Maria, Pepe, Sergio Ramos and Xabi Alonso are among the more than 50 players signing for the set. 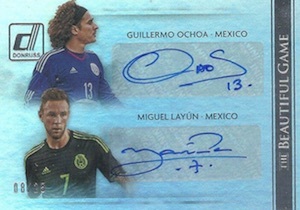 In addition to single-signed cards, Beautiful Game Signatures have multi-player versions with two, three and four autographs. Pitch Kings is an insert that's inspired by Diamond Kings, one of the most recognized names in Donruss' sports card history. Taking a somewhat artistic approach (or in this case, some dabbling in Photoshop to give an artistic effect), the set includes some of the top international players such as Cristiano Ronaldo, Lionel Messi and Neymar. International Superstars features top players in their national team uniforms. 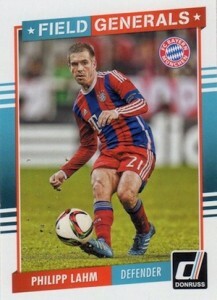 The various field positions in the game each have their own insert set in 2015 Donruss Soccer. Goaltenders are spotlighted in Clean Sheets. Defensive Dynamos takes on top defenders. Midfield Maestros highlight those who make things happen in the middle of the field while Fantastic Finishers is all about the forwards who get the majority of the goals. 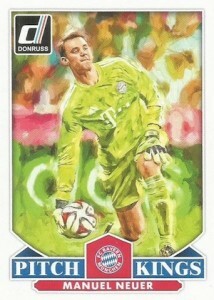 Among the clubs represented in 2015 Donruss Soccer are Real Madrid, FC Barcelona, Bayern Munich, Paris Saint-Germain and AC Milan. The United States, Germany, Brazil, Argentina and Mexico are some of the national teams found in the product. 21 cards. View a detailed gallery. 3 cards. Serial numbered #/65. These look awesome. Hopefully the autograph checklist is amazing and the price of the product isn’t ridiculous like some products like this tend to be. Design looks awful. Anyone got an idea what the return on a box break should be ? the product will be avilable 04/15. theres no info regarding return as theres no box opened and now card sold til now. priceguide graph is for wc prizm.. no sense at all?? this will probably sell better than the other Donruss products with the variations and #d cards which werent that relavant in baseball,bball and football. There seems to be a decent autograph checklist. The only problem will be 1 auto per box. if there were 2 or 3 autos per box it would take off . 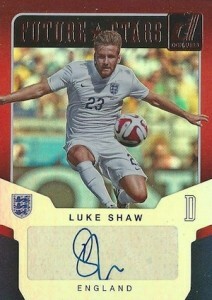 but the 1 auto will keep this product limited to the die-hard soccer fans only. 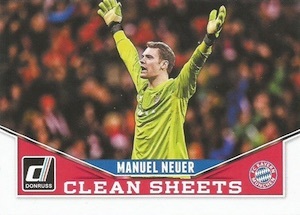 then when select soccer releases this will almost be forgotten by hobby collectors. Just picked up a box of these cards and I love it!!! Not sure why people giving 2 stars? wish it had serie A players, other than mediocre AC Milan. I just pulled a Ronaldo and Bale dual auto! Awesome product! This product was a nightmare of sets , I opened 9 cases and when all said and done I had 237 complete basesets , 12 Master serts , for the price its a fun break. In 9 cases I could not complete any of the following base autograph set, a bronze press proof set, a silver Press proofs In 9 cases I only got one 1/1 card If you are looking for autots please check out my ebay store I have up to 5 of each one and I am positive i can complete any set you are doing.